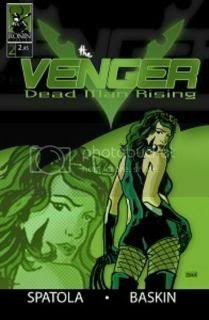 The Venger: New Artist Rising!!!! 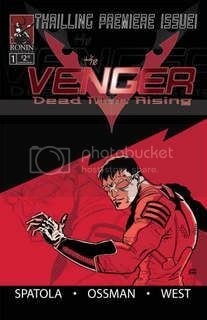 I am happy to announce that Tim Baskin has recently come on as the new artist on The Venger: Dead Man Rising, starting with #2. He is jumping into some big shoes by taking over for Jason Ossman. But Jason had decided to take a break from comics and instead focus his energies on what is truly more important- his family. Naturally I'll miss my partner but I am excited for the book and excited to be working with Tim. Jason has promised to still be around though so who knows we might see more of him yet! Tim is doing a great job on the book. I have seen some rough pencils for the first few pages and he is really capturing the look and feel of The Venger: Dead Man Rising. He has a good sense of sequence and page layout. Plus he is as excited as me about what is coming up in the series. This picture is what helped me decide to ask him to join the Venger team. Tim is a fellow Ronin Studios member and had done the pin-up as a favor for me. When I saw this I knew he would really fit. And Jason agreed. 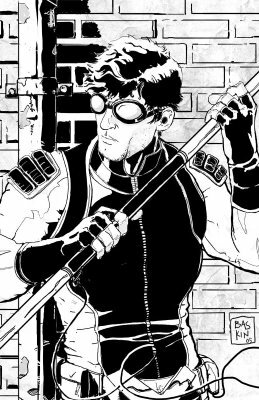 I'll post a few of those rough pencils soon for you all to see. In the menatime enjoy this Venger pic by my new partner Tim Baskin!